This amazing process starts every Spring when a deciduous shrub native only to Mexico begins to bloom. The shrub is known as Sebastiana pavoniana which grows on rocky desert slopes in the states of Sonora & Chihuahua, Mexico. The female Jumping Bean moth Laspeyresia saltitans lays her eggs on the immature ovaries (capsules) of the shrubs flower. After a few weeks the eggs hatch and the tiny insect larvae (worm) eats its way to the inside of the flowers capsule. 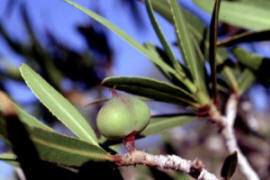 As the shrub matures, the capsules that contain the insect larva become hard and changes to a brownish color. The moth larvae, now trapped inside his new home, begins eating the developing seed inside the capsule as food. 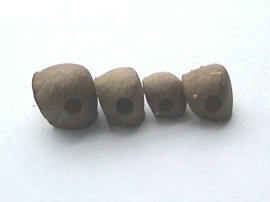 After the first spring rains occur, the capsules separate into three sections and fall to the ground. Those capsules that are lucky to contain a moth larvae inside begin to "jump" on the forest floor. Our mysterious Mexican Jumping Bean has come to life. 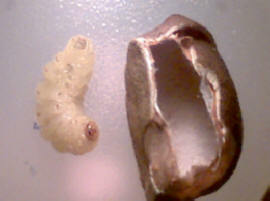 After months of jumping, the moth larvae will go dormant for a short time and begin spinning a cocoon inside the capsule. This is the stage when the larvae will undergo metamorphosis and an adult Jumping Bean moth will emerge. The moth will fly off into the desert and this amazing life cycle is repeated for the next generation of Mexican Jumping beans. Picture of a Mexican Jumping Bean worm (moth larvae). This is what is inside the bean making it jump. Museum photo donated by Joe Lillian & family. 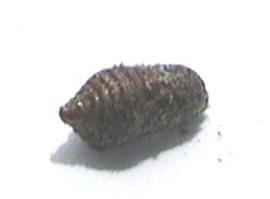 Pupa Stage. This is the stage within the bean the worm begins metamorphosis. 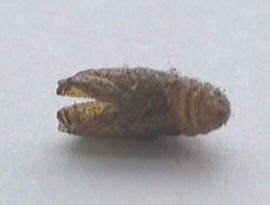 Empty pupa case. The adult moth emerges from the case after completing metamorphosis. (moth larvae) entered the bean. 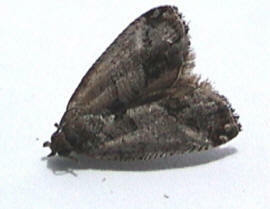 A full grown adult Jumping Bean Moth. The moth will emerge in May and will only live a few days. Jumping beans that the moth has emerged from. The exit hole is almost a perfect circle! The ripening capsules of the shrub Sebastiana pavoniana. 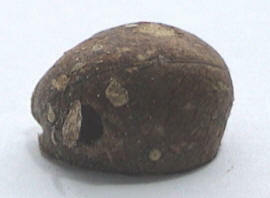 At this stage, the moth larva is already inside the "bean". MORE PHOTOS TO COME AS WE EXPAND THE MUSEUM! Use of photos: Children, teachers, future Nobel Prize winners and all interested parties are free to use the above photos for reports or personal use. Please give photo credit to Beans That Jump. Thank you. post these photos on Ebay or any other auction site. The cyber eye is watching!